Got a vacay planned or a party to attend? This vanity cask is your one-stop destination for complete skin care at a whopping price. If you have been skin conscious & summer got you even more worried? Fret not! 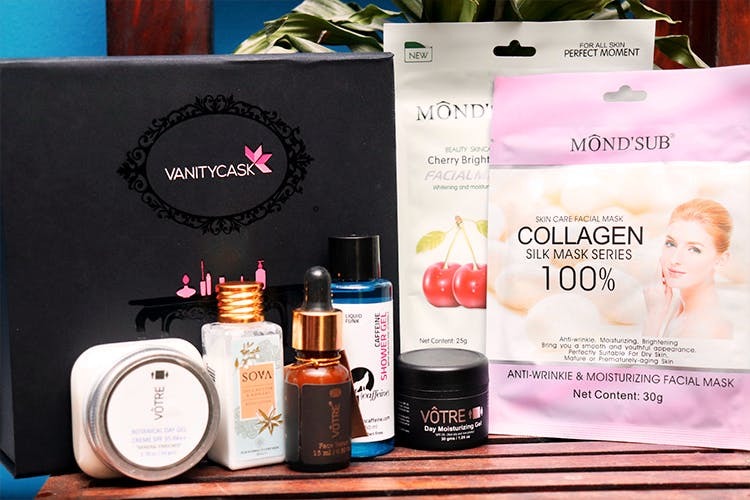 This unique subscription box from Vanity Cask has curated the best products from head to toe skincare. It comes in stylish black packaging that consists of a moisturizing gel, herbal hair mask, caffeine shower gel, a cherry facial mask and an anti-wrinkle mask for some wholesome pampering. All the products in the box are made with the goodness of natural products and have a soothing fragrance to it. We are totally crushing on the gel-based moisturizer from VÔTRE Day and MOND’SUB Cherry Facial Mask that is absolutely easy to carry & super effective. The caffeine shower gel from MCaffeine & Mom’s Therapy herbal hair pack will instantly put you in a good mood!